Focus Trial did it ! They are proud to present the english version of their webzine (see Focus Trial, a new trials webzine!). Focus Trial is simply a virtual magazine talking about trials using images, hence mainly composed of pictures and graphic compositions. Indeed, there will be very few words, since our ambition is not to write. We let our Friends from Tribal Zine write the good articles ! Beyond the magazine itself, Focus Trial’s ambition is also to develop a real artists’s community around this sport. We want to share images and experiences; but also to discover, support and promote creators. Whether you’re a photographer, graphic designer, painter... you’re welcome to contribute ! Come and share your talents! Feel free to contact us at contact@focus-trial.com! 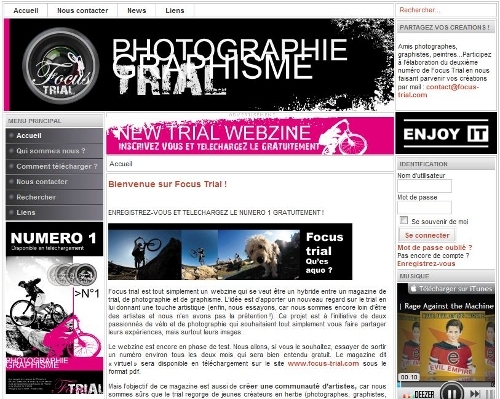 It’s important for Focus Trial to share the webzine with the whole bike trial community. So, they’re gonna try to bring out two versions, each time: french and english. ENJOY IT. Click to go to the download page ! 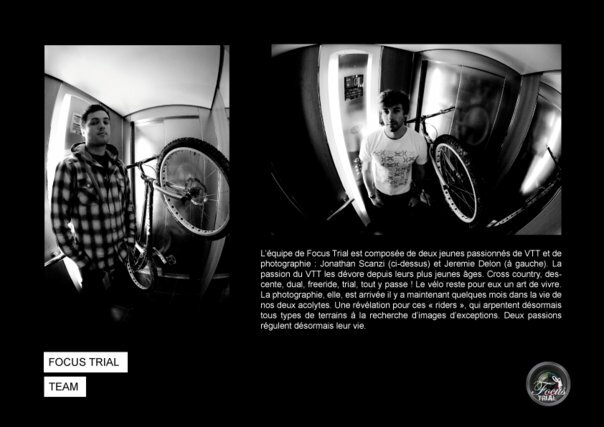 The Focus Trial team is composed of two young MTB and photography fanatics: Jonathan Scanzi and Jérémie Delon. Passion for MTBs has driven them from a very early age. Cross country, downhill, dual, freeride, trials, they love it all! Bikes are a way of life for these guys. Photography came into the picture (no pun intended) a few months ago. It was a revelation for these young riders, who scour all kinds of terrain for the perfect photo. The two passions, often combined, rule their lives. And as "happiness is not real unless shared", they decided to add this webzine to their hobbies. The world’s No. 1 online trials magazine is now associated with the world leader of the discpline, the K-124 group, who have been leading the sport for ten years now with their innovative new parts and bikes and their team of super-human riders! The French, European and World Champion has been preparing for next season since the start of the month with a new coach - Xavier Barbier from Performance Athlétique ! An interview with Cédric Fontenoy, who has launched a new brand of competition trials bikes, Inpulse, and a team of riders to represent it, with his brother Aurélien Fontenoy at its head! An exclusive interview with Spanish Elite rider Raúl Gutiérrez, in which he tells us about his 2009 season and his goals for 2010. A Spanish section has been added to your "for riders by riders" website, with a certain Alvaro Lopez, administrator of Spain’s N°1 forum Trials-Riders.es, at its helm! Happy Holidays from Tribal Zine! Joyeuses fêtes & meilleurs voeux ! Happy holidays and all the best for 2010 from the whole Tribal Zine team! We’ve got plenty planned to make it a good year for you all! Danny dans le New York Times ! La saga MacAskill continue... Le pilote Inspired/Red Bull a fait l’objet lundi dernier d’un article dans le prestigieux New York Times, qui revient sur son incroyable ascension, depuis son premier vélo jusqu’à aujourd’hui ! Vittorio Brumotti... Trials, politics & TV ! Vittorio Brumotti... Trial, politique & TV ! Trials is getting media coverage in Italy, thanks to Vittorio Brumotti, who mixes the sport with politics in a TV show that has 8 million viewers a day! Rockman have sent us some exclusive photos of their 2010 20" models, the Aurem III and the Manus, which are constructed from U6 Aluminium and are even lighter than before! Rockman have unveiled their 2010 20" range: The Aurem is still in their catalogue, with a few changes (anodised finish, even lighter frame) and a new, shorter model has joined the ranks - the Manus! Last week we showed you Bruno Arnold’s new Curve 26. Now here are some studio photos of Ozonys’ new ultra-top-of-the-range bike. Jorge "Mister Trial" Ferreira, a well known face on the Portuguese circuit, with five Portuguese Champion titles under his belt, has sent us these photos of his new bike, a Rockman Slate that weighs just 8.565kg! Peter Green is a Russian trials rider from Moscow, a passionate street rider and designer who has just put a brilliant website online that allows trials riders the world over to connect with each other. The new Rock products have arrived at Trialprod - Superb forks with a one-piece steerer, new riser bars and brake pads with CNC backings!